Students gain insight on a useful alternative energy source with the Biofuels: Investigating Ethanol Production and Combustion Kit. 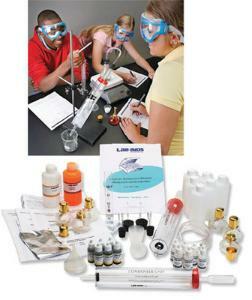 This kit gives students a thorough look at ethanol and combustion through three different investigations. Investigation One demonstrates the fermentation of cane sugar and corn, the two food sources most commonly used to produce ethanol, and the distillation of the fermented stillage to produce fuel. Investigation Two examines the energy released by the combustion of ethanol and kerosene and compares their results. In the final investigation, students compare and measure carbon dioxide and particulate matter, the two by-products of the two fuels and discuss the trade-offs of fossil fuels and biofuels as sources of energy.